her first trip as a WIMCO agent. 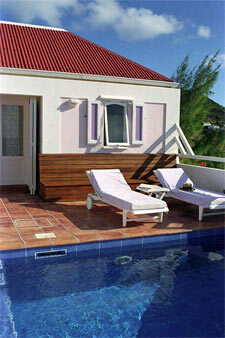 When I think of choosing a villa for a Caribbean vacation, the first thing that comes to my mind is the view. Yes, each house may have the latest DVD, satellite TV and gorgeous French fabrics in the sunroom, but what I want to know is, is there a special place where I can sit and watch the world go by? I had a chance to visit more than 50 villas and hotels this summer on Anguilla, St. Martin and St. Barts and the ones that stood out to me were the ones with a view – more specifically my view. It seemed they all had a view of either gardens bursting with color or rolling surf, distant islands and the deep blue of the Caribbean Sea. But on St. Barts there was one spot in particular where I stepped out onto the terrace and spied a bright yellow fishing boat bumping out of the harbor, heading out to sea. I could see passengers scampering off the ferry and merchants hawking their wares on the street. Someone else may choose to watch the waves break on Anses des Cayes or track an island schooner sailing north to St. Martin, but watching the hustle and bustle of the harbor would be my choice. 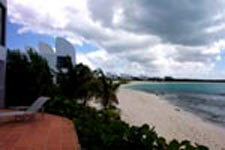 WIMCO clients have tastes as varied as the dozens of villas I visited in the islands. My job here is to match those who enjoy the hustle of the port with the harbor view and to place those seeking solitude in front of an endless stretch of ocean. Let me rewind and tell you that I officially started with WIMCO in September. Unofficially I began with WIMCO in early August when I accompanied WIMCO reps Lidy Schalekamp and Alison Hentley on a three-island, 10-day Caribbean whirlwind. Before joining WIMCO I worked for 14 years with one of the first walking tour companies, the Wayfarers. The Wayfarers is a 20-year-old British company that organizes exclusive walking tours in the U.K., Ireland, France, Italy, Switzerland, New Zealand, Australia and the United States. I worked hard to develop personal relationships with my clients in order to find just the right "view" for each and every one. Finding that secluded curve of sand, or, depending on my client, that hopping penthouse in the thick of it all is now my job at WIMCO. My time in the travel industry has taught me, among other things, to roll with the rum punches, which is good because not all arrivals are as peaceful as the view of St. Barts Marigot Bay. Lidy and I flew from New England to San Juan where we discovered that our late afternoon flight to Anguilla was delayed and later canceled. We flew to St. Martin with the airline’s promise of a hotel near the airport but after checking into our rooms we found everything was closed – even drinking water was unavailable. We melted ice from the ice machine and went to sleep. The next morning we missed the 8:30 ferry to Anguilla and arrived an hour late, racing to Cove Castle to meet up with Alison (who had spent a lonely night rattling around her empty, luxury suite!). Our "luck" held when we missed our ferry to St. Martin later that afternoon and arrived, late again, in a tropical downpour. A complimentary Mercedes from the rental company should have turned the tide for us, but after only 15 minutes aboard our magic carpet we drove through a "puddle" harboring a large metal pipe. We heard a bump and a rip and emerged on the opposite shore with a flat tire. 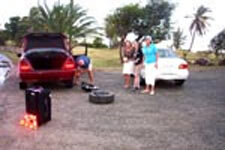 Our Good Samaritans arrived in the form of an American couple with tire-changing abilities (who coincidentally owned one of the villas we represent). We unloaded our luggage from the trunk, located the spare and got to work. Sunset arrived, a harbinger of the quick descent of night. When the tire repairs were complete we set forth to seek out our villa in the darkness. "But when she got there, the cupboards were bare," so we drove to Marigot for dinner where we reunited with our friend "tropical downpour" just as our food arrived at our wonderful outdoor table. I actually watched raindrops splash into my wine glass! Our triumvirate of excitement was completed two days later when, within an hour of our arrival on St. Bart, we were witness to a motor scooter accident. Anne, our local representative, was leading us to our villa and as she turned left into the driveway a scooter sped out from behind us and crashed directly into her car! We literally watched this guy fly into the air and land on the road. An ambulance arrived and took the man to the hospital. We heard later that, unbelievably, he escaped with no broken bones.